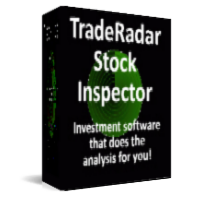 Installation Note: Trade-Radar Stock Inspector will work just fine on Windows 7, Windows 8 and Windows 10; however, you might need to adjust Compatibility settings before running the install. In the meantime, we will need to confirm your email address. To complete the user group subscription process, please click the link in the email we just sent you. But first, go ahead and download the software. Download the Trade-Radar free trial full install now! This free download consists of a self-extracting installation program containing the Trade-Radar executable file, Trade-Radar database, new technical analysis component and all supporting files from Microsoft and Trade-Radar. Note that Trade-Radar Stock Inspector is provided as shareware. You have 45 days to evaluate the entire program. After that time the Dashboard functionality, automated data loading, signal generation and reporting will be disabled though the charts and the Portfolio Manager will still be available. At any time, you can register from within the program and get a license key to unlock any disabled functionality. and receive a $10 discount! Suggest new features, report bugs or other issues by sending me an email. This software contains no ads or any other kind of spyware or malware! THE SOFTWARE AND DOCUMENTATION ARE PROVIDED ON AN 'AS IS' BASIS, WITHOUT ANY WARRANTIES OF ANY KIND, INCLUDING, BUT NOT LIMITED TO, ANY IMPLIED WARRANTIES OF MERCHANTABILITY OR FITNESS FOR ANY PARTICULAR PURPOSE. YOU ASSUME THE ENTIRE LIABILITY FOR THE SELECTION AND USE OF THE SOFTWARE AND DOCUMENTATION, AND TRADERADAROPERATOR SHALL HAVE NO LIABILITY FOR ANY ERRORS, MALFUNCTIONS, DEFECTS, OR LOSS OF DATA RESULTING FROM OR RELATED TO THE USE OF SOFTWARE AND/OR DOCUMENTATION. TRADERADAROPERATOR SHALL NOT BE LIABLE TO YOU FOR ANY INDIRECT, SPECIAL OR CONSEQUENTIAL DAMAGES OR LOST PROFITS ARISING OUT OF OR RELATED TO THIS AGREEMENT OR YOUR USE OF THE SOFTWARE AND/OR DOCUMENTATION, EVEN IF TRADERADAROPERATOR HAS BEEN ADVISED OF THE POSSIBILITY OF SUCH DAMAGES. IN NO EVENT SHALL TRADERADAROPERATOR'S LIABILITY HEREUNDER, IF ANY, EXCEED THE PURCHASE PRICE PAID BY YOU FOR THE SOFTWARE AND DOCUMENTATION. THE WARRANTIES AND REMEDIES SET FORTH ARE EXCLUSIVE AND IN LIEU OF ALL OTHERS, ORAL OR WRITTEN, EXPRESS OR IMPLIED. SOME STATES MAY NOT RECOGNIZE THE FOREGOING LIMITED WARRANTY, LIMITATION OF REMEDIES AND/OR LIMITATION OF LIABILITY AND, IF YOU QUALIFY, YOU MAY HAVE DIFFERENT AND/OR ADDITIONAL RIGHTS AND REMEDIES. YOU SHOULD CONSULT THE APPLICABLE LAW IN YOUR STATE IN THIS REGARD. TRADERADAROPERATOR RETAINS ALL RIGHTS NOT EXPRESSLY GRANTED. NOTHING IN THIS LICENSE CONSTITUTES A WAIVER OF TRADERADAROPERATOR'S RIGHTS UNDER THE UNITED STATES COPYRIGHT LAWS OR ANY OTHER FEDERAL OR STATE LAW.